The stationary shear for sectional product is an alternative to the use of cold saws or abrasive cut-off machines. The shear featuring a cutting force of 6300 MN can cut sections and solid shapes of large dimensions. A patent-protected cutting system is employed; so cut finishes comparable to those obtained on saws or abrasive cut-off machines are also achieved for beams. 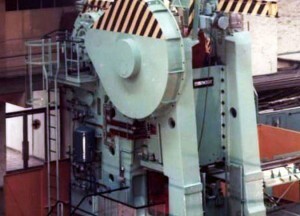 Given the shear’s high cutting frequency, it is often possible to install only one shear in place of two or three cut-off machines. By contrast to the tooling on cut-off machines, shearing-knife wear is minimal.